Yes, I am doing this. I am publishing this post. And I am publishing this post even when I am well aware that it is going to stir up controversy. How does she dare, I can almost hear you say, create a quiz about subject-verb agreement when she is not even a native speaker? I might regret it, but the truth is that I sort of needed to clarify in my mind one of the most obscure points of grammar in the English language- namely that of subject-verb agreement-, because contrary to what one might think a singular subject in English does not always demand a singular verb, and what looks like a plural subject might not be so and take a singular verb instead. To top it all, when there is disagreement among grammarians, both singular and plural forms can be used. To create this quiz, I have done a lot of research on the Internet and read what some noted grammarians have to say about this issue and I have found that they don’t always agree. 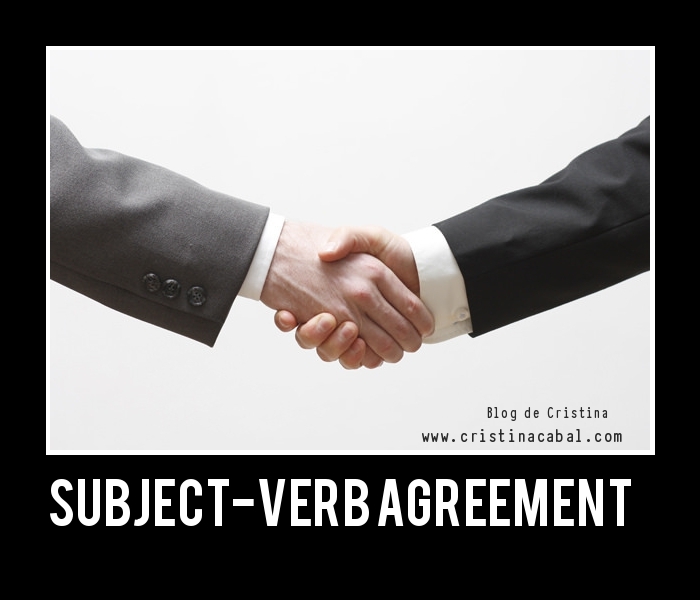 For this reason, I have tried to avoid the most controversial subject-verb agreement issues. Perhaps, it would be interesting for everybody to learn which questions you failed and the reason. Thanks again! I disagree with some of these as a native speaker. Reasons : A team is a single noun and therefore takes a single verb. If you say it is a group of individuals (as you may with family) it ceases to be a ‘team’. ‘Neither’ x nor y has had …equates to ‘not (one) nor( the other)’ for me and therefore would only take a singular verb. I’m sure the grammar books may support what you say in the quiz, but books are only as good as the corpus examples they are based on and language changes, has regional norms etc. Wow! This Is really a great quiz! But it is quite difficult for me, what I believed was singular was plural.l’ll try it again to undertand it better. Thank you very much for your valuable feedback. I agree with you that we have to take into account regional variants as well as language changes. On the other hand, it is also true that as native speakers of a language and depending on the area we live in, we tend to favour more either the singular or the plural when both forms are considered grammatically correct. As a native Spanish speaker, and when asked about some grammar issues, I find myself wondering whether a certain grammatical structure is correct or not, or even if both are possible, because what I don’t use I find hard to remember. It’s certainly a very interesting issue that sparks off lively debate! Thanks again! Thank you very much for your comment Oliva! Since there are so many variations both regionally and across borders of native English speaking countries, examples where “both are possible” will raise people’s ire depending upon where they learned their English. b) which of the options is more common in which form of English (spoken, written etc). …and as such, giving examples of say “google hit counts” can help students (and natives!!) accept that other people use the language in other ways. As an example, “These data are” generates 32,000,000 hits on google whereas “This data is” generates 76,000,000. Such data can help students to decide which they will try to commit to memory and use. Yes, that’s a good suggestion. After I published this post, there was a lively discussion in the school I work in, as some teachers learned their English in Australia, whereas others learned it in the USA or Great Britain. It was really interesting! And I entirely agree with you that we should use the corpora when doubts arise. (See my article here https://www.cristinacabal.com/?p=6434). However, I think for practical purposes, we need to give our students something tangible to rely on and this is an issue that, unfortunately, lots of grammarians disagree on and it causes lots of trouble to students. Many thanks for sharing this great resource, it must have taken a long time to research and make. This is such an important area and can be hard to teach effectively. It generated lots of interesting discussion in the class, especially when I asked my students to make their own sentences using the rules/patterns. Thanks for your feedback!I am glad you and your students found it useful! Loved the quiz. I am working on an e-learning module for Subject Verb Agreement myself. And I am glad I have included all rules in my lessoon. Thank you, Cristina. Keep posting more stuff like this. Yes, though this grammar point is quite controversial and I have tried to avoid the most debatable ones.